Earlier in this series, I talked about the importance of business and consumer engagement in the success of local search. Here are some statistics based on research I conducted in the Portland market. Staking out a presence online is the most basic step, and it seems that most businesses are taking this step. With the exception of foursquare, all of these numbers are substantially higher than I expected. Proportion of businesses using each tool. 86% of businesses I looked at had a Web site. The quality of the Web sites varied tremendously, but generally included business location, contact information and hours. Some included sample menus. Most weren’t regularly updated. For businesses that had Twitter and Facebook presences, links to those sites were usually provided. A few embedded Twitter feed widgets right on the home page. “Claiming” a page on local search sites that consumers use provides a number of benefits that vary by site, including the ability to edit your map position, enter information such as hours of operation, post special offers, see metrics about visitors to your page and respond to reader reviews. Perhaps the most important benefit is to keep competitors and malicious users from messing with your page. Claiming is a relatively low-effort activity. Foursquare lagged with only 5% of businesses claiming their foursquare page. Twitter does not provide a default presence for businesses, yet 55% of businesses I looked at had a Twitter presence. Many of these were regularly updated with information on specials, events, industry news and closings. Several food carts used their Twitter presences in place of Web sites. See my earlier post, Twittering up some dosas. Several businesses had abandoned their Twitter accounts and were not included in the charts. Profile page – Businesses set themselves as if they were people and were friended as if they were people. Group – Businesses created a group. Customers joined these groups. Page – Businesses created a “Page” which customers could originally “Fan” and now “Like”. Places page – Businesses in theory automatically have a Places page which people can check into. In practice, finding these businesses can be difficult because Facebook’s search tools don’t deliver consistent search results. Combined page – Businesses can merge their Page with their Places page. The combined page is the fullest featured one. 35% of businesses had both a Twitter and Facebook presence. For businesses on both platforms, the median followers was 424 on Facebook and 323 on Twitter. Some of these businesses used tools, such as Facebook’s Twitter sync, to feed the same information to both platforms. Consumers are engaging with local businesses online. 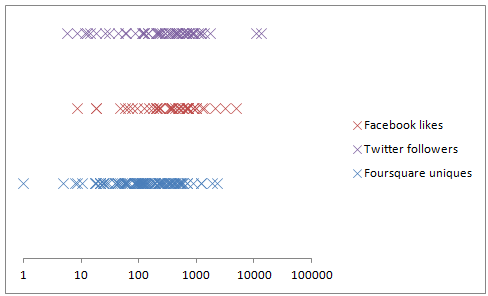 This chart shows the range of followers on Twitter and Facebook. (These numbers are directly comparable.) The chart also shows the number of unique users who had checked into venues on foursquare. The ranges are quite wide: foursquare (1 to 2385), Facebook (9 to 4998) and Twitter (6 to 14027). There was no clear pattern to the outliers; I expected this to be correlated to the size of the business, but it didn’t seem to be. The outliers also varied by platform. 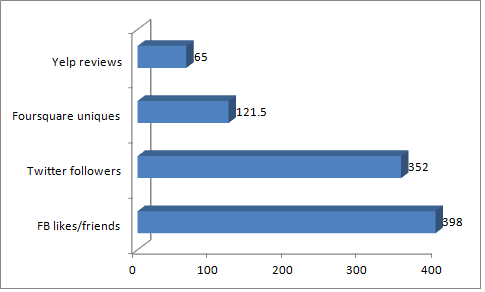 Distribution of followers and unique users. The medians from the above chart are summarized below. I also added the median number of Yelp reviews. Although the numbers may not seem large in the absolute sense, they represent a highly targeted list of consumers who have expressed interest in a business and are likely to be repeat customers. Distribution of check ins on foursquare and Facebook. The range on foursquare was 1 to 3695; on Facebook, it was 0 to 1587. The medians were 192 for foursquare and 63 for Facebook. In every case, foursquare checkins were higher than Facebook checkins. Part of this can be attributed to the fact that foursquare has been around longer. Mostly, I’d attribute it to the selection bias of foursquare users and its game mechanics. 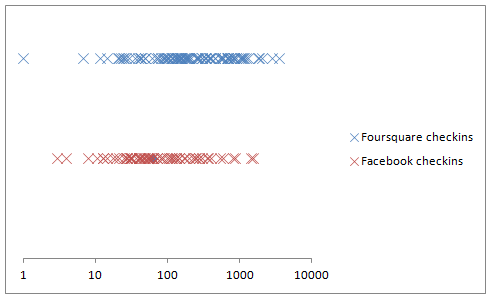 The range of checkins per unique user for Facebook was 1 to 4.06. The median ratio (on a venue basis) was 1.56; the median on a user basis is likely lower. Given that many venues require 5 or more checkins to get to mayor, this indicates that checkins are driven by a small proportion of users. The above charts are based on a review of 100 local businesses in the Portland area, focused on high consumer value and frequency categories such as restaurants, bars and cafes. National chains were excluded from the sample. The sample included a mix of new and old businesses and businesses that ranged in size from food carts to large restaurants and brewpubs.